Increasing your curb appeal is one of the most important things to do if you ever want to sell your house. 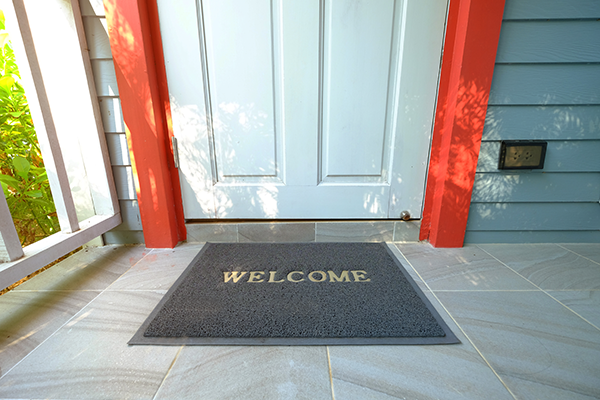 Even if you’re not trying to actively sell your home, you can still make your home more appealing to guests and neighbors. There are a ton of ways to improve your homes’s visual appeal. Because some are more expensive than others, consider your budget and your home’s overall style before deciding what to change. Hanging a wreath may seem like a simple thing to do, but the right wreath can make a huge statement. You can have it match with the house for each holiday. The wreath that fits best for a holiday will usually have some fitting images and colors that are associated with that specific holiday. For example, a nice wreath on Halloween can incorporate some typical orange, black and gold as well as images of pumpkins and ghosts. For Thanksgiving, a wreath with fall colors like green, brown and orange can have a pumpkin and a turkey, or even a simple statement that says “give thanks”. For Christmas, red and green mixed in with some Christmas lights and tiny ornaments can make any door look cute. Christmas is also a good time to put a spray or real wreath that has Christmas lights wrapped around it for an extra nice look. You can put one of these lit-up wreaths on the front door and pair it with a single candle in each window for a pretty look. A pretty red bow on it will top it off with a festive feel. Stained glass may be something that you see in churches or fancier buildings. For example, in older architecture such as beginning of the century buildings like state capitols, giant stained glass windows often cast a beautiful light that created a unique feel. A homeowner can also put stained glass in their front door to make it look elegant and stand out from the curb which is just what those selling homes want to do. Some front doors have a transom window above that allows for stained glass to be inserted. Otherwise, stained glass can be in the glass itself in the door. In the glass can feature different images as well, such as a flower or even varying geometric shapes. It’s always amazing what a nice fresh coat of paint can do. Depending on your door’s material, you may need to paint it more often than other materials. For example, wood tends to be a higher maintenance material, meaning that you may need to paint it more often. If you are unsure of how to paint a front door well, get a handyman or local painter to do the job. It’s not too costly, and getting it professionally done really makes it stand out. Most doors already have a knocker attached, but some do not. If you want to add a class to your front door, go for a knocker which comes in many different forms. Door knocker usually looks like a ring that someone can hold on to in order to knock on the door. They come in a variety of materials from bronze to silver to bright colors. Some knockers can even be images or shapes, like a lion or a rectangle. If you have a more modern looking home, a geometric shape may be creative such as a rectangle with a square. In a more traditional home like a colonial, a nice brass piece that is more modest will fit nicely. Be sure to choose a knocker that meshes well with the rest of your home’s look. It may seem like an obvious idea, but changing up the doorknob can make a world of a difference. After all, it’s what people grab hold of when they come into your home. You can change the color by going for a silver knob as opposed to a brass knob. There are also darker colored, almost black knobs. Monogram letters are a nice way of representing a home as yours. You can opt for one large letter representing your last name and hang it on your door. There are many companies that make monogram letters in varying sizes. You’ll want to make sure that it can take the outside elements. Not all monograms can take precipitation. If you live in a Craftsman style home, or even a more rustic type like a prairie style, wood cut outs can be the perfect front door addition. Big letters that you buy at a local arts and crafts store can be painted in an earth tone or a color that matches your house, such as an off white or eggshell. You can also buy them pre-made for a nicer finished look and feel. Some cut-outs can be decorated to change for each season. Placing nice plants all around your front door is a great way to spruce it up. You can also put some tropical plants if you live in a warm climate like in Florida or California. If you live in a more modern home, you could place a pretty colored locus plant or even a bonsai tree around your front door. Anything that will make your door stand out and really pop will be appealing. 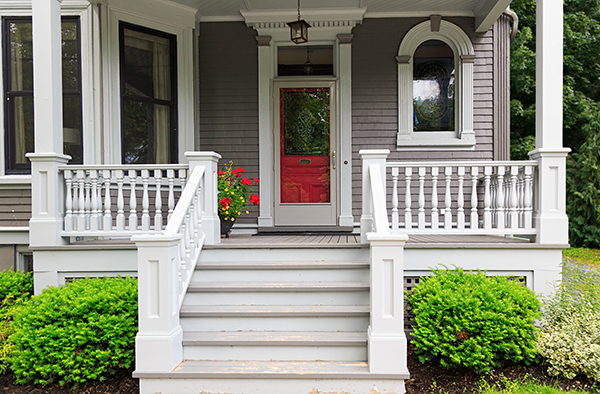 Boosting your curb appeal can help you sell your home and make you the envy of the block. It’s a nicer way that makes you feel proud each and every time you pull into your driveway. Feldco offers plenty of style and hardware options to choose from when it comes to all types of doors. Our doors are durable, dependable and affordable. Let Feldco help you get started on your home renewal project. Speak with a Feldco representative right now and get a free quote.